As I stated yesterday, God knew we would need redemption before He created Adam. It thrills my heart to know that my loving Father knew I would make mistakes and poor choices, yet He created me regardless. As I read and studied Genesis 2:7 my heart was amazed by God. Picture with me a dusty ground. What comes to mind as you imagine it? I smell dirt and can feel the heat rising from the ground. I can even feel the wind blow some up on my body. Our awesome Father created us with the finest of details from the dust on the ground. Our bodies are so complicated and each part serves a purpose. Think about your organs, vessels, and arteries. Feel your body breath in and out. Think of your brain and all it does and can do. Can you imagine thinking of every detail and working them together as our God did? God did it, and did it perfectly. Nothing is difficult for Him. He gave me breath, yet it is taken from me when I think about how wonderful and loving He is. 6 After He said these things He spit on the ground, made some mud from saliva, and spread some mud on his eyes. 7 "Go," He told him, "wash in the pool of Siloam" (which means "Sent"). So he left, washed, and came back seeing. Mr. Henry stated, "When our Lord Jesus anointed the blind man's eyes with clay perhaps He imitated that it was He who at first formed man out of clay." Mr. Henry's thoughts continue with the next verses. 21 Jesus said to them again, "Peace to you! As the Father has sent Me, I also send you." 22 After saying this, He breathed on them and said, "Receive the Holy Spirit." 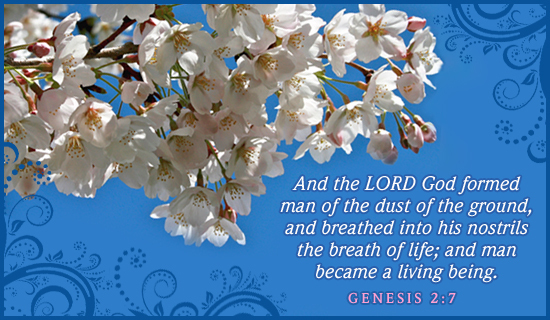 Mr. Henry said, "...and when He breathed on His disciples, saying receive the Holy Ghost, He imitated that it was He who first breathed into the man's nostrils the breath of life." Jesus begins a life and will rescue that very life when called upon. Our lives are not mere accidents. We are very much planned and desired. "He that made the soul is very much able to make it new" (Matthew Henry). Oh, yes he can and does, my friend. Thank you sweet Jesus for being so loving to your children. Thank you for reaching down and picking us up every time we call for you. You are worthy of our praise. May you hold your head high and know that you are loved and treasured.